You already met Portland Dream nail polish from Alessandro Viva La Diva limited edition. This time I have for you 3 other mini polishes from the same collection. Aloha Le, City Grass and Margarita Mambo decided that it’s high time for little bit of team-building so they joined forces in sponge manicure. This manicure really pushed basement cleanup up the priority list. I had nothing to work with! Only thing left to do was play the game – find everything you need in the apartment. Sponge was least of my worries – I just used one of the foundation sponges … that I haven’t used for intended purpose for a very, very long time. Mixing polishes on packaging from daughters latest toy was also piece of cake + cardboard instruction came really handy as I was to lazy to get up and get toothpick. I can’t say it is the best sponging I ever did, but it’s not too bad either. 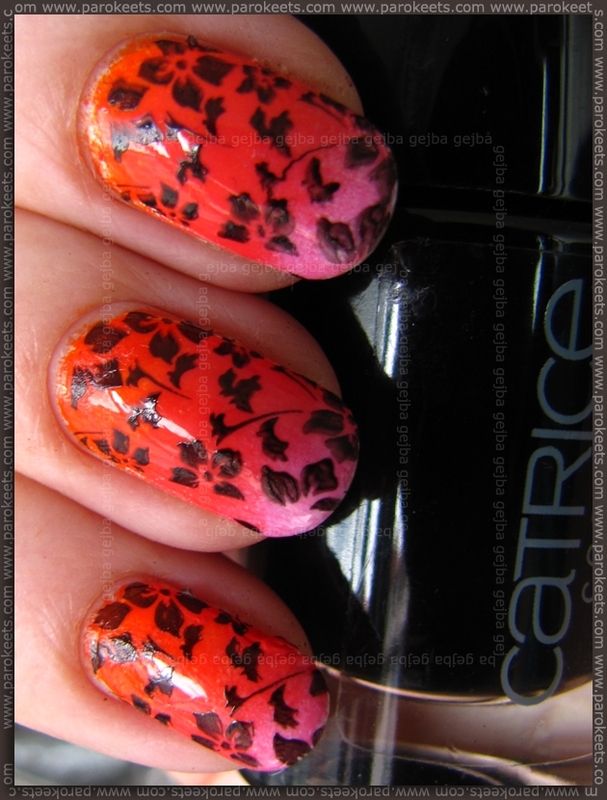 But then disaster struck – how in the world I don’t own single stamping plate with very fine/thin pattern?!? I desperately need new stamping plates, so all your recommendations are sincerely welcome. Alessandro Slovenija decided to spoil one of our readers so they donated all three nail polishes from Viva La Diva LE I used in my sponging experiment + Portland Dream. Tell us in comment which of the Alessandro nail polishes was your favorite so far (from all of the limited editions, regular lines, Striplac …). V Maxiju ga nisem videla, mogoče Nama ali pa kakšne bolj zakotne Boutique drogerije? Po pravici povedano, sem velika ljubiteljica (skoraj) vseh alessandrovih lakov, a me vedno najbolj pritegnejo izdelki iz njihove Go magic! čudežne malhe :wink: . Prav ne morem mimo stojala, da se ne bi slinila nad njihovimi izdelki – Croco glam, Crystal punk, Thermo twist, Nail dots, kaviar efekt, magnetkoti….. Če bi pa morala izbrati prav en odtenek, ki se mi je najbolj vtisnil v spomin, bi izbrala Idolic indigo iz ene izmed njihovih LE. Glede Alessandrovih lakov slišim same pozitivne stvari. Na Ptuju jih še nisem zasledila, tako, da jih še nisem preizkusila. Nimam še nobenega, zato bi tele lepotce z veseljem preizkusila. A imam samo jz težave z razumevanjem vprašanja? :blush: :biggrin: Nisem zihr, a sprašuje po najljubšem laku iz te kolekcije (Portland Dream; pa še ime me zanima kje so najdli..) ali nasploh (Hypnotic ♥)..
Joj mene isto kot simono, ga občudujem že res dolgo. Za belo podlago bi bil popoln.